Poland Archive - No Regrets! Everyone in the group knew that today was going to be heavy. Visiting the concentration camp was something all of us were looking forward to but a little scared of at the same time. 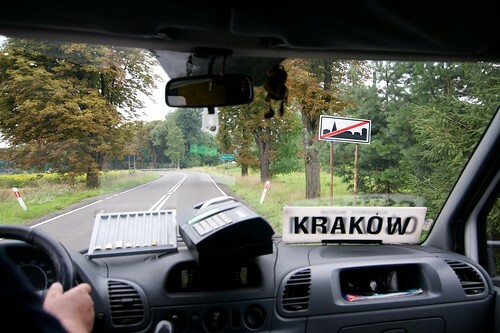 We hopped onto an early morning shuttle from Krakow, sharing the cramped van with locals heading to the suburbs. Frank, who spent some time in the fruit trade, told me that the giant green grapes I was eating were “Waltham Cross” grapes. As we passed through small towns, street signs displayed town names, but some of them had a red slash through them as if they used to be there but no longer existed. I remarked to Frank that the red slashes must signify towns that were destroyed in WWII and no longer exist. The truth is much less dramatic. A red slash through a town name means that you are leaving that town. Woke up sweating and sore. Out the window, a beautiful sunrise over the Polish countryside. Alex and I visited Tacheles, a recommendation from my friend Chris. The historical and partially demolished building is now a haven for artists. 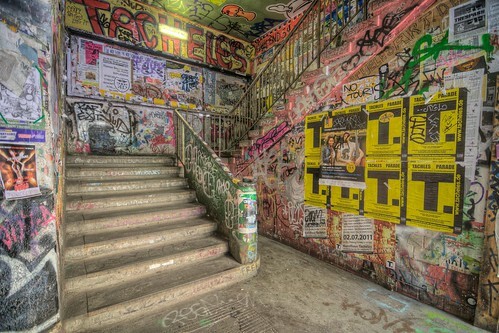 It’s filled with paintings and graffiti and sculptures. It smells like paint and mold and piss.